Commercial areas, especially retail spaces, are subject to high traffic and automation is necessary for entrances. Sliding and revolving doors are commonly installed with a measure of automation. While revolving doors may look highly aesthetic, they have their drawbacks. Sliding doors are better from several aspects and when automated, deliver faultless service for years while allowing ease of use. Automatic sliding doors are available in different configurations to suit site conditions and the width of the opening. One can choose single sliding doors, bi-part type sliding doors, or even telescoping sections type for wider openings. Doors may be designed for light duty applications as in office environments or for heavy duty use as in retail stores where there are hundreds of customers arriving and leaving each hour. 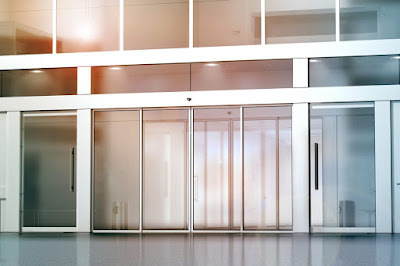 Doors in office environments also need to be automated and fitted with some form of access control system for better security while slide doors in commercial spaces can be sensor operated. Automated sliding entrances are necessary especially when interiors are air-conditioned and one needs to ensure that the temperature is maintained. Most types of pedestrian slide doors are usually constructed of aluminum frame sections with glass. The frames may have single or double glass panes for better insulation. Doors may be top hung or bottom mounted and the drive may be fitted accordingly to suit site conditions and user preferences. One must look for heavy gauge frames, thick glass panes, and sturdy motor and mechanical parts to ensure durability. Office spaces may have sliding doors fitted with access control system that may be card based; fingerprint based biometric type or eye scan type. Commercial retail spaces usually have sensor based control units that sense proximity of an individual on either side or on only one side of the door to activate the drive unit that opens a door. Speed of operation and reliability of the sensor activation mechanism are features one must examine closely. A manufacturer may simply design and manufacture the door components while sourcing the automation part comprising of sensors, motors, and gear unit from a specialist manufacturer. Whether to choose a bottom mounted or a top rail mounted door is up to the site conditions and user preferences. Generally top mounted mechanisms are more popular since they tend to remain clean and are easy to access and clean. Bottom mounted mechanisms, especially drive unit may be more prone to becoming dirty, and it may require more maintenance. Where there is automation, there is also the chance of failure of the door to open or to close. Buyers need to be careful to choose doors that have some form of override in case of such failure and also back up mechanism to assure fail-safe operation. It is desirable to have a drive motor that runs on DC and can switch to battery power in case of failure of mains power. Safety is also to be considered from another aspect. An individual may remain in the doorway and the door may close and squeeze the individual. Safety mechanisms must be incorporated in the door to sense when an individual is between the sliding partitions and prevent the panels from closing in order to avoid any injury. It may also happen that the mechanism may be jammed so there should be a provision to allow for manual override or to disengage the drive and open or close the door manually. All these fail-safe features, sensors and backups are usually integrated into a sophisticated computerized control system on a PCB that should be easy to replace should it fail and thus reduce downtime.